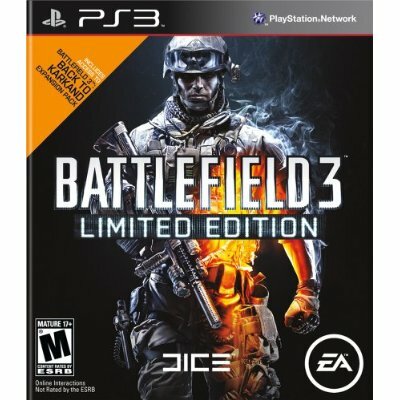 Once again, my awesome girlfriend has showered me with her love by pre-ordering me the limited edition Battlefield 3 a couple of months back, today was claim day and I finally got my hands on this much awaited game! Along with the Limited edition in game freebies, I got a pretty cool free shirt too as a part of the package, too bad they only had medium, it's a bit too big but what the heck. Let's get to it! To anyone who has played games from the Battlefield franchise, you know that when comes to making awesome virtual warzones, Battlefield makes it to the top of the list, well, my list at least, but I’m sure many would agree. When I purchase a game, I consider 3 things, the campaign aspect, the multiplayer aspect and the replayability of the game. First off, let’s tackle the campaign aspect of the game, the story revolves around a conflict between the Middle-East, some Russians and the United States. Since I hate spoilers, I won’t discuss this one too much. It’s a short campaign where you are put into various scenarios with some dramatic events and effects which adds more flair to the well structured storyline, the scenes are acted out well too adding more life to the story. Although the main scenes are quite one dimensional, which kind of show similarities to Call Of Duty Black Ops (I won’t go into any more detail, buy the game and play it to see what I mean). I was a bit disappointed though because the wit and personality of the previous games in the series such as Bad Company and Bad Company 2 weren’t integrated, I think that these aspects would have given the campaign more strength. On to the multiplayer aspect, this is where the magic happens so to speak. There are two parts here, the Co-Op multiplayer and the real deal 12 vs 12 multiplayer. The Co-Op multiplayer is technically a two player online mission based experience, meaning you’re up against AI, yes, sadly it can only be played online and only 2 players can be utilized, and there are only 6 missions to play and replay, which are somewhat related to the campaign. To be honest, these missions are more challenging than some of the campaign missions, too bad there are only 6 to choose from. They also added a nice touch to it though, you can unlock weapons by earning points from the missions and the weapons you unlock can be used in Multiplayer. To unlock all weapons, would require multiple repeat playthroughs of the missions here. Now on to the icing on the cake, the real multiplayer, which I believe is the heart of this game. There are about 9 maps where the 24 player action can take place, each one varies in size and scenery as well, ranging from urban, industrial, military and more “nature oriented” locations. And one of my favorite parts of this game is the concept of destruction, which I first got introduced to in the Bad Company series. But in this game, it seems to have been enhanced and which makes it more awesome. Most of the structures can be damaged and destroyed using the various tools for destruction at a players disposal, this adds more dimension to a game because this can create new paths as well as remove locations to hide behind. This environmental manipulation is key in creating more strategic opportunities for you and your team and as we all know, it’s always good fun to just blow stuff up. Of course, one can’t forget the vehicular aspect of the game, this time around, there is more variety added and each map, may or may not have vehicles in them, each map will also have a different set of vehicles available for use. From Humvees to Buggies to Transport Vehicles to Tanks to Rafts to Helicopters and to the latest addition, Jets. Each vehicle provides a tactical advantage, if used properly and effectively, these can turn the tide of a battle in an instant. Sadly though, there is no way to practice Jet flight and Helicopter flight offline which is needed because these vehicles are one of the most complex ones in the game but once mastered, they prove very effective and useful but to the inexperienced (myself included) they prove frustrating and annoying or entertaining to the rest of the players when witnessing an out of control jet or helicopter plummeting to the earth or heading straight into a mountain or building. But I believe the most important aspect of the game is the one closer to the player, which is the class and loadout selection. It’s pretty much the same as Battlefield Bad Company 2 which is composed of Assault, Support, Engineer and Recon classes each having class specific loadouts. There are new items that have been added though such as the EOD Robot for the engineer which can arm charges and repair vehicles. There are class specific unlockables, including weapons and gadgets, as well as weapons specific unlockables that include accessories and attachments, you can also unlock specializations that enhance your classes, there are level specific unlocks as well. There’s one noticeable part of the multiplayer that is new and I find quite a fun challenge, it’s knife killing, in Battlefield 3, you can no longer just walk up to an enemy and slash him in the chest, it takes about 2 slashes or a sneak attack from behind which rewards you not just with the dogtag of your victim but a pretty cool short action sequence as well. Similar to the previous Battlefield games, the key to victory and progression is through the use of teamwork, because almost every teamwork related action is rewarded, from spotting an enemy to assisting in a kill. When your team is working well together, it provides an exciting and rewarding multiplayer experience. Going back to the 3 things I consider when buying a game, I’d say Battlefield 3 gets 2 ½ out of 3, multiplayer and replayability which is pretty good considering that the campaign isn’t too bad to play. Overall, I think that Battlefield 3 is worth the purchase, you are sure to have a decent campaign experience, then once that’s accomplished, you can move on to the intense and fun multiplayer aspect of the game or just start right there and play the campaign later on. Either way, the game holds a high replay value as well as a challenging and rewarding experience. For those who enjoy a good first person shooter, intense multiplayer experience, I highly recommend this game, and as for veterans or fans of the Battlefield franchise, this is an automatic purchase. Overall: I think this game deserves a 9/10. The campaign is short but intense and exciting. The Multiplayer is really what makes this game shine.